Like designing your own styles to dress in but not skilled with complex stitching or comfortable with creating new patterns? From their shapes and size to their scale and appearance, skirts and umbrellas have a lot in common – except, perhaps, that when it comes to an umbrella the interior is designed to be seen publicly and thus is as carefully considered and crafted as the exterior … whereas, well, looking up a skirt … that might get you in trouble. 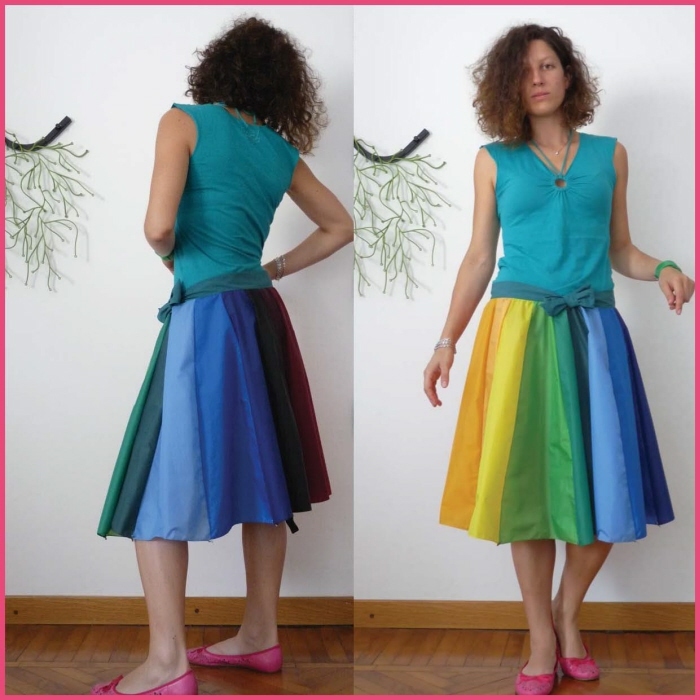 But seriously: used umbrella material is a perfect choice in many regards to upcycle into a skirt, dress, other easily-planned piece of refab clothing, as designer Cecilia Felli discovered during her creative umbrella-to-skirt upcycling experiments. Moreover, since umbrellas are well known for breaking down, this provides a simple do-it-yourself way to take advantage of something that frequently falls apart. Umbrellas come in all kinds of colorful, creative and unique patterns that convert readily into skirt material for women, girls or whoever wants to wear them. The designs also tend to radiate out from the center and often have tips that work well as dress-ready accents too. Best of all, they are made of rain-resistant fabric for tough weather conditions are constructed to be at least as durable as clothing materials. Can’t you just see these on people zooming around town on their bikes in a bit of rain (with bike shorts underneath, one would hope)? What can you do with a broken umbrella? Now you’ll have a clever idea when it inevitably happens to you. 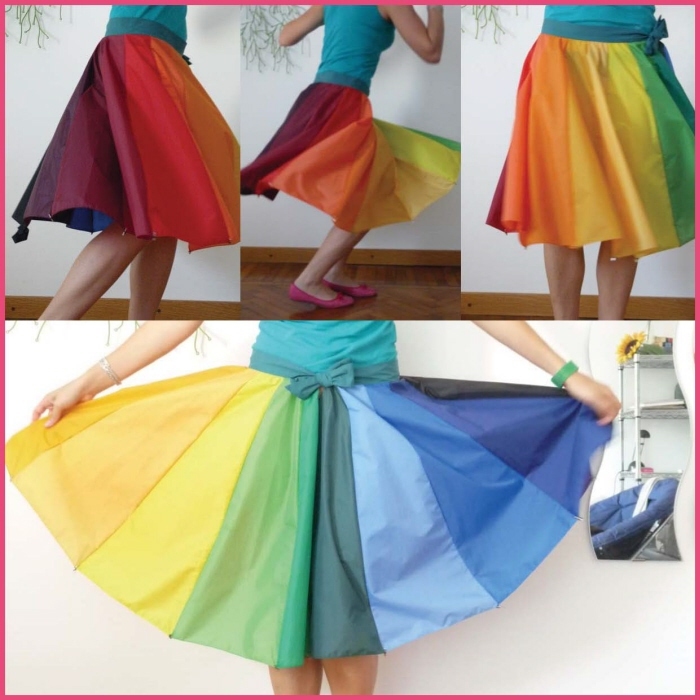 This recycled fashion creation is so easy to make and so ready to twirl, it’s a wonder it isn’t already in stores everywhere. You might even be tempted to “fix” something that isn’t broken so you can get just the right pattern to fit into your wardrobe.